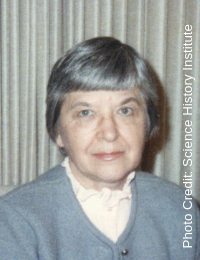 Stephanie Kwolek (1923–2014) was born in New Kensington, Pennsylvania. When she graduated from the women’s college (Margaret Morrison Carnegie College) of Carnegie Mellon University, she applied for a position as a chemist with the DuPont Company, among other places. At DuPont the polymer research she worked on was so interesting and challenging that she decided to drop her plans for medical school and make chemistry a lifetime career. Kwolek was in her 40’s when she was asked by DuPont to scout for the next generation of fibers capable of performing in extreme conditions. She unexpectedly discovered that under certain conditions large numbers of the molecules of these rodlike polyamides become lined up in parallel, that is, form liquid crystalline solutions, and that these solutions can be spun directly into oriented fibers of very high strength and stiffness. Following this breakthrough many fibers were spun from liquid crystalline solutions, including the yellow Kevlar® fiber. Kevlar® has gone on to save lives as a lightweight body armor for police and the military; to convey messages across the ocean as a protector of undersea optical-fiber cable; to suspend bridges with super-strong ropes; and to be used in countless more applications from protective clothing for athletes and scientists to canoes, drumheads, and frying pans. Kwolek received many awards for her invention of the technology behind Kevlar® fiber, including induction into the National Inventors Hall of Fame in 1994, only the fourth woman member of 113 at the time.